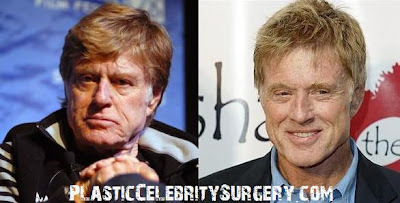 Robert Redford before and after plastic surgery. Well if it isn't Robert Redford, the movie star actor legend extraordinaire himself, looking like a brand new man after going under the knife for an apparent facelift. Robert Redford has clearly had a significant amount of plastic surgery done recently, but what exactly has he underwent? I would say a definite brow lift, some major lift around his cheeks and jawline, plus a possible eye lift, including a canthopexy, which is meant to remove those pesky bag underneath the eyes. Looks to have gotten a slight nose job as well. Sure, this is a drastic transformation of the Robert Redford many of us knew, but you gotta admit he is looking pretty sharp following the surgery, and at 73 years old, let the man live a little, right? He is only one of the greatest actors of the century. Has underwent? Don't you mean has undergone? I dont think he had surgery. He has a different haircut and is smiling so his face is lifting up. I don't see less wrinkles. its fairly obvious Robert hadalot of work done on his face- he doesnt have the sagging jowls anymore,his cheeks are much fuller(probably cheek implants),his chin looks bigger making his face longer(chin implant),no more "shopping bag" eyes,and Botox between his eyebrows because the scowl is now gone.He probably had a chemical peel also because his skin looks much less "pitted" now. He also had "filler" injected into his frown lines. I dont think he had a brow lift because the eyebrows look normal. If anyone thinks he is "aging gracefully" and hasnt had any work done,then they are either being nice,or are blind. I don't think that's Robert Redford. Just saw Redford on a PBS promo and one eye looked bigger than the other. Something about his face is definitely screwed up. Why can't these Hollywood types just leave their faces alone. They all end up looking like a bunch of clowns. Geez - I'd much rather see an old celebrity who's faced up to the reality of aging than one who looks like a damned clown. Ha,ha,ha,..Nor surgery there dummy, he did what he always does, he got in shape! shed the fat put on muscle. Fat collects every where don't you know, our eyes, your nose, your cheeks, face all over. By toning up his face looks well framed, but he is done that all his life, a fat lazy person like you could not understand. As for ignoramous, clown. Yes fat distorts the face, he just got rid of it, don't be jelous, don't be a hater man. i think at your 70's it's a bit too late. Why bother anymore? If you do it, do it when you are 50 or 40. And as little as possible, how can they even recognice redford anymore after this? If he had any work done on his face, then I'd like to respect his decision. It's his face, after all. It just makes me sad and a bit disappointed that he went against what he used to say a lot even until the late 90s that he didn't believe in trying to have his face reconstructed. I thought he was too smart, real and deep and therefore would know that his God-given good looks could not be reconstructed by even the very best cosmetic surgeons in the world. Just as only God can make a tree, only God could make a young and beautiful Robert Redford.